H.O. Wolding is based out of Amherst, WI and has been a family owned business for over 75 years. They specialize in hauling dry-van goods and mostly operate regionally. H.O. 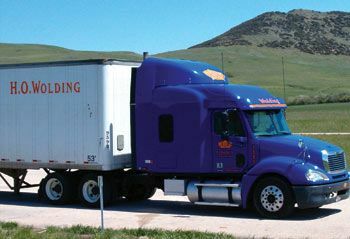 Wolding (also called H.O.W) is a medium sized company which hires experienced drivers as well as recent truck driving school graduates. Tuition reimbursement is offered with many new drivers landing a regional position with weekly hometime immediately following training. 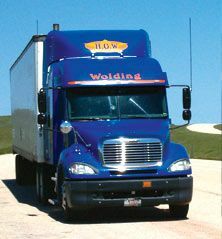 Since HO Wolding is a smaller company, they only offer a terminal at their headquarters in Amherst, WI. They do, however, have 16 drop yard locations across the United States and all drivers are allowed to take their trucks home with them during time off. Applicants must live in H.O. Wolding specified recruitment hiring area. All applicants are required to hold their own valid Class A CDL in the state in which they reside and must have held a valid Drivers License for the past four years. Applicants are required to complete a ten-year verifiable work history with either W2’s or written verification. If self-employed, applicant will need legal documentation to verify dates (tax records). Recent class A CDL School graduate (within 30 days of graduation) or at least 6 months of recent driving experience. No more than one preventable motor vehicle accident in past five years. All preventable accidents require applicant to provide copy of the accident report. H.O. Wolding (H.O.W) Trucking Minimum Hiring Qualifications Cont. No major violations in past three years such as 15 Miles or More over Speed Limit. No more than two moving violations in any 12-month period for past five years. No suspension or revocation of license due to a moving violation in past five years. Reviewing Committee will review any non-moving violations and suspensions. No Careless, Reckless or Following-too-Close convictions within past five years (At Fault Rear-End accident considered following too close). No more than one moving violation in past 12 months and no more than three moving violations within past five years, including speeding tickets. No DWI, DUI, OWI or BAC convictions within past five years, no more than one in a lifetime. No DWI, DUI, OWI or BAC convictions with commercial vehicle within any time period. See the map for current hiring locations and fleets offered. Please note that OTR positions are available in all hiring areas and central Arizona has a very small Southwest Regional fleet as well. While H.O. 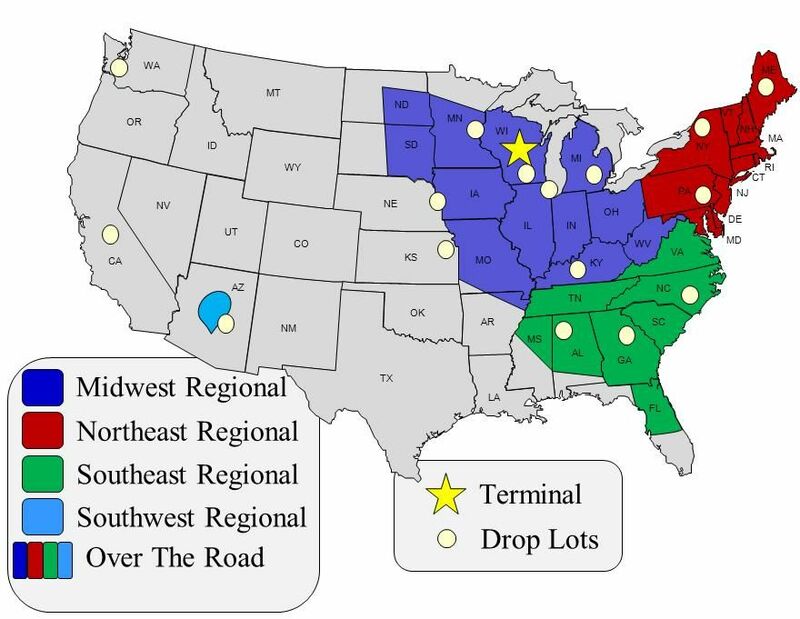 Wolding operates through all 48 continental United States, most of their business is regionalized in the Midwest, northeast, and southeast. Most new drivers will have the opportunity to run regional directly following company training. Drivers who have graduated from an approved CDL school within the past 30 days will receive 3 weeks of paid company training. Forced To Team After Training? No, all drivers are able to become solo drivers directly following training. H.O. Wolding pulls dry van freight exclusively. On trips of 260 miles or less, drivers will receive and additional $.03 per mile. Any driver who completes a minimum of 28,250 miles during a 4 month period will receive an additional $.01 to $.04 cents per mile for all miles driven during the previous quarter. Drivers that do not have any preventable accidents during the previous 4 calendar quarters are eligible for the quarterly safety bonus. The bonus is $.01 per mile paid quarterly. Drivers will receive 1 extra week of vacation following 5 consecutive years without having a preventable accident. A cash award of $50 following the first year and an additional $50 for each consecutive year thereafter, up to a maximum of $500 per year, for driving without a preventable accident. Medical plans offered are a Base Plan, with low weekly premiums and premier coverage, as well as, a Buy Up Plan that has a higher weekly premium with platinum coverage level. Both plans offer greater saving in deductibles and discounts when a preferred in network provider is used. But there is a coverage level still available with both plans outside the preferred network. Eye exams are covered under the medical plan. Two medical plan options to pick from. Eligibility for enrollment is available after 60 days, with coverage starting the first of the following month. Eligible spouse and dependents are welcome. Dental plan that can cover you from preventative care to major care levels. A $10,000 Life/AD&D insurance policy is offered to all full-time employees with the company paying the full cost of the premiums. Short Term Disability coverage is offered to all eligible full time employees with the company paying the full cost of the premiums. Supplemental policies are offered for additional life insurance, long term disability insurance, accident, critical plus a vision plan that will cover the cost of eye wear is also offered. For a pre tax saving opportunity, an FSA (Flexible Spending Account) is available to all eligible participants in the group health plan. Tuition reimbursement is offered to recent graduates of an approved CDL truck driving school. Graduates must have been hired within 30 days of graduation in order to receive tuition reimbursement. If all eligibility requirements are met, drivers can receive up to $10,000 in reimbursements paid at $200 per month. For drivers in the OTR fleet, one day off is earned for each week on the road. However, the majority of H.O. Wolding drivers run a regional fleet with weekly hometime, usually on the weekends. A regional fleet is usually available immediately following training but will depend on each individual drivers home location. An immediate family member is allowed with pre-approval and a small insurance fee. Pets are not allowed on any company equipment. Most trucks are not equipped with an APU. Idling is allowed during uncomfortable temperature ranges. Drivers in the Northeast Regional fleet may be required to carry freight into or out of NYC. You are not required to have a hazardous materials endorsement. You will not be required to travel into Canada. Trucks are limited to 65mph. Average age of a truck is about 2.5 to 3 years old. Most trucks are 10 speed manual Eaton Fuller transmissions. Approximately 80% of freight is drop and hook. Electronic logs are currently being implemented. The majority of drivers operate solo, but team opportunities do exist. Drivers with less than one year experience will earn $.35 per mile with drivers earning $.41 per mile with more than one year of experience. All mileage pay is based on truck miles and split between two drivers. While local positions are somewhat rare, there are some positions available in certain major metro areas which can get drivers home everyday. A wide range of regional and dedicated positions are available which will get drivers home at least once per week and usually on weekends. These opportunities will depend entirely on where you live.